Hi, I found your listing on autoTRADER and would like to test drive 2012 Audi Q7. Thank you. TOP OF THE LINE!!!S-LINE!! 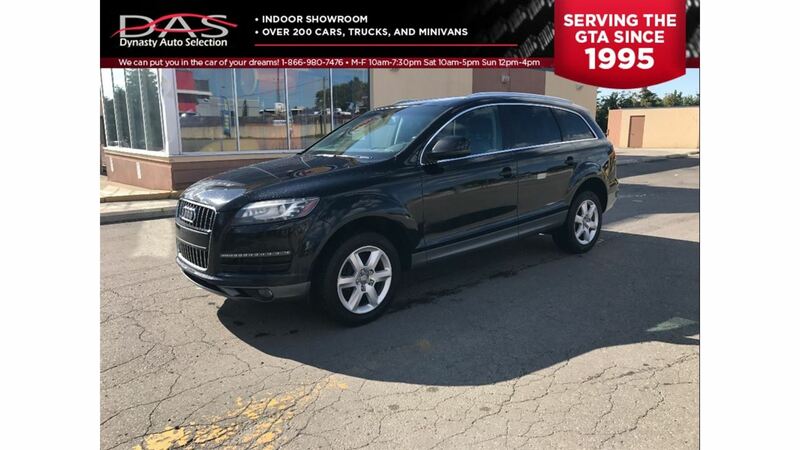 !BLACK/BLACK LEATHER,NAVIGATION,PANORAMIC SUNROOF,7 PASS,REAR VIEW CAMERA,ONLY 71.000KM,AWD,BLIND SPOT ASSIST,FREE OF ACCIDENTS,FROM VW CANADA FINANCE,MINT SHOWROOM CONDITION,FOR ONLY 26.999..Interested in this vehicle? We offer financing for all credits, Good or Bad. Want to know if you are approved? Get started with your finance application through our SECURED application page. Click HERE to get started. A representative from Dynasty Auto Selection will contact you to let you know if you are approved. For more information email dynastycars@gmail.com or call us today at 1 416-645-0196. Our Sales team is happy to help! Dynasty Auto Selection excels in assisting clients find the vehicle they desire. We take the extra step to disclose all information regarding any vehicle in stock with full transparency before taking the next step to purchase. This is done to ensure you have a full understanding of the vehicle you are buying. Before displaying any vehicle, we have them go through a Pre-Sale and Post-Sale inspection at the auction to ensure they are mechanically fit and sound. For your own peace of mind, you always have the choice to inspect our vehicles through your preferred mechanic. Our Vehicle Certification is available for only $595.00 that includes Ontario Safety Standards Certificate with exact measurements, professional detailing and 1-month warranty for every safety item! If not certified as per OMVIC regulations the vehicle deemed to be not drivable, when not certified. Look at the services we offer to give you the peace of mind you deserve: Vehicle Certification (Ontario Safety Standards Certificate with exact measurements, professional detailing, and 1-month warranty for every safety item) available for $595.00 Free Carfax History Report Certified In-house Mechanic Extended Warranty with Lubrico Warranty Available (See below) Financing with rates starting as low as 4.9% APR *Terms and Conditions May Apply* We Accept Trade-ins and save you money on the difference Dynasty Auto Selection takes pride in delivering their promises and keeping new and returning clients happy within 20 years of being in the Used Car industry. Our indoor showroom displays over 300 vehicles with various brands to choose from; Audi, Volvo, Acura, BMW, Lexus, Mercedes, Honda, Cadillac, Toyota, Nissan, Ford, Infiniti and much more. We are located in North York, Ontario at 2424 Finch Ave West, Unit 1, North York, ON M9M 2E3 *Extended Warranty with Lubrico Warranty* Dynasty Auto Selection has been partnered with Lubrico Warranty in the last 20 years. Lubrico Warranty has nearly 40 years of providing mechanical breakdown protection to hundreds of thousands of car buyers since 1977. Over 2,500 repair centers to protect customers from unforeseen repair expenses. No Claims made within your term? You can Double Your Term! Certified Power-train Plus Coverage: 24 month/Unlimited km Power-train 3 month/Unlimited km Comprehensive 36 month/60,000 km Power-train 6 month/10,000 km Comprehensive 48 month/80,000 km Power-train 12 month/20,000 km Comprehensive Call our sales team at 1 416 -645-0196 for more information on Lubrico Warranty. This vehicle is $3,042 BELOW MARKET (10%) in the Toronto area. It is analyzed against similar 2012 Audi Q7's and is based on kilometers, transmission, trim, and options. I agree to recieve text messages and phone calls from DYNASTY AUTO SELECTION INC at the phone number that I have entered above. I understand that the message and data rates may apply.